Fourteen year old Adenine is blind and isolated in her small attic bedroom. The last carrier of the Death Plague that wiped out thousands of her country’s people twenty-five years ago, she must avoid contact with the outside world. When her mother fails to bring her food Adenine begins to starve. Driven by her hunger, Adenine ventures into the house discovering her mother bedridden and sick. Despite her terror of infecting others, Adenine fumbles her way onto the streets of Borrelia in search of the town’s doctor. Soon, she is surrounded by new friends… and enemies she never knew existed. Adenine’s mother is keeping dark secrets, her friends are lying to her and when threats arise she must decide who to trust. Concealed Power is a book I stumbled on one day while browsing through Amazon. The story sounded unique and my interest was piqued by the mysterious Death Plague. I'm so incredibly happy that I decided to take a chance on this book. While not exactly the book I was expecting it was still a great story overall. 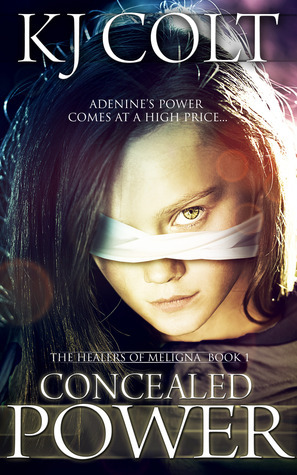 One of the things I found highly enjoyable about Concealed Power was the main character Adenine. This poor girl just cannot catch a break. Yet despite her circumstance her attitude remains mostly positive. By the end of the story I just wanted her to have some happiness and while she does in a small way it also comes with more tragedy. I'm so happy Concealed Power isn't a stand alone. I'm hoping in the next book Adenine's life turns around and she can succeed in her mission. I just don't think I can handle another book of her being dealt so much sh*t. Even the strongest willed person has a limit and I feel Adenine has nearly met her quota. I also really liked the Author's writing style. The story flowed off the page. Every character was easy to distinguish and I actually enjoyed the first person narration which for me can really make or break a book. Thankfully in Concealed Power the first person narration works. Lastly I liked the world this story is set. In many ways I kept thinking this book was set in the same time period as Grave Mercy by Robin LaFevers. I could even imagine Adenine coming across those characters in court even if they had no clue they were both in separate stories. Once I had that visual in my mind it was easy to picture everything else. I might be completely off base but for me this world and that one felt interchangeable. Obviously the stories are completely different but the era to me felt the same which is probably why I enjoyed it so much. Now even though I really liked Concealed Power I did have just one small gripe. I really wish the story had a bit more action. There were a couple instances where I felt once I turned the page something explosive was about to happen but when I actually did make it to the next scene either the characters moved on or they were still talking. I know the author isn't shying from violence so I can only assume that she wanted to keep the tension high. If that's the case then she was successful. Overall, Concealed Power was a great story and one I can't wait to continue in book 2. If you like a real character driven story then I highly suggest picking up Concealed Power. With that being said, I will be rating Concealed Power by K.J. Colt ★★★★. Want to learn more about this book or Author? Click the links below! I love stumbling upon random books on Amazon. Yay for it turning out to be a great read! Of wow!! Sounds like an interesting read! I like plenty of action in a book, but the next one may step it up a little!! Glad to see you enjoyed it still!! Great review!